So your Realtors advice is that you need to update…panic sets in as dollar signs flash before your eyes. Deep breath, we have some advice from the experts on how to tackle this on a budget. This week we will focus on how you can transform your house for a shoe string budget. 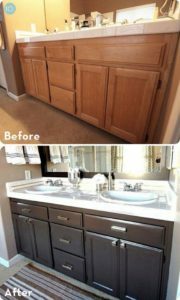 Todays topic we will discuss bathroom cabinets. 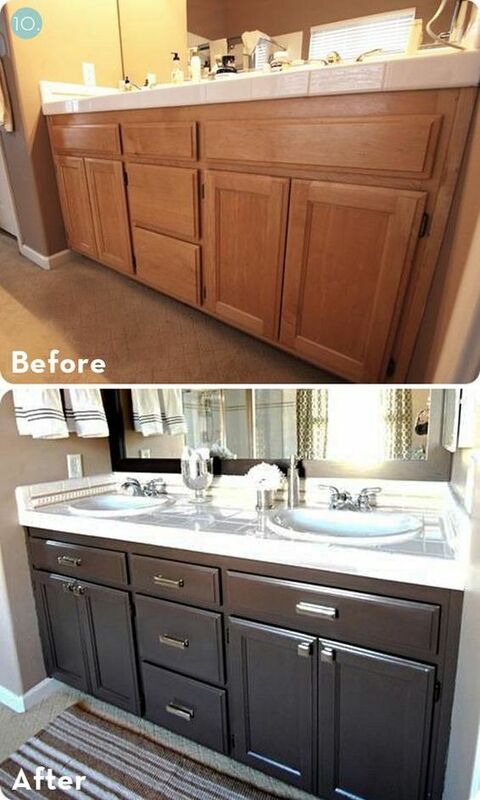 No need to rush out to the home store and get new cabinets. There are several products out there right now that allow you to transform your look for under $50. As for the brand we recommend getting samples and testing it out before committing on brand/texture/color. A degreaser and elbow grease to clean the surfaces really well, some light sanding to allow paint to really grab to the cabinets. Here are some finished product examples we got off Pinterest…. If you have painting supplies then this type of transformation can be had for under $50!! Stay tuned we will be posting videos soon of some of our Realtors who will be doing this themselves on their own homes!